Chevron so nearly won the title in 1972. After the Montjuich Park race they led the table and the only remaining round had been cancelled - hadn't it? But Abarth persuaded the organisers of the Jarama race to change their mind and brought in ringer Derek Bell to win the race, and the title. It was a deserved win; Arturo Merzario had won three races for the team and easily secured the drivers' title, and Toine Hezemans had also won one when standing in for Merzario at Vallelunga. After the success of the 1971 B19, Chevron had made only detailed changes for 1972, mainly to meet new cockpit rules. 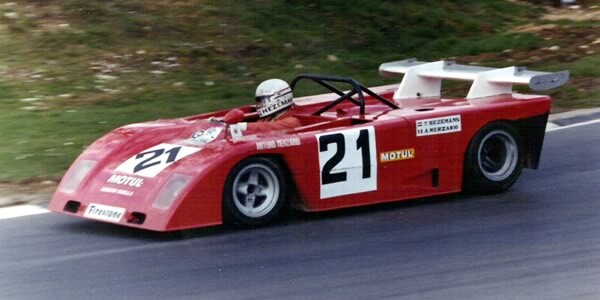 Enzo Osella had taken over the Abarth team and made significant aerodynamic changes to the Abarth SE021 for 1972 but the only entirely new car for 1972 was Lola's full-monocoque T290. Engines were the key ingredient this year and one of the Chevrons was fitted with a development 2-litre BMW engine which, with four valves and three plugs per cylinder, was by far the most sophisticated powerplant. Dieter Quester took the car to a win and a second in his first two races but then wrecked it at Enna and it did not return. Alan Smith's highly developed 1900cc and 1930cc FVCs kept leading Chevron runner John Burton competitive but Lola's experiment with Cosworth's Chevrolet Vega-based EA engine proved a dead end. Cosworth's new alloy-block Chevrolet Vega engine was ready for the start of 1972 but it suffered reliability problems in the first few races and the leading drivers were reluctant to trust it. Vic Elford and Guy Edwards scored good finishes at Enna in August in Vega-powered Lola T290s but that proved something of a blip as it would be ten months before a Vega finished another championship race. The works Chevron B21-Vega always qualified well but always retired early. The quickest engine to appear in the championship was undoubtedly Dieter Quester's BMW with three pole positions from four appearances. Alan Smith continued to develop the Cosworth FVC, producing a 1900cc version called the FVC 'B' which was used by all the leading Chevron runners including both Canon Racing Team and Red Rose Racing. The Cosworth FVC remained numerically the dominant engine, powering three-quarters of the top 6 finishers. The other 13 were powered by Abarth (8), the Vega (3) and BMW (2).